Lately I’ve been doing a lot of thinking about my health. No, there’s nothing wrong … at least, that I know of anyway. I’ve been exercising since my early twenties when I started havin’ babies and I’ve kind of been slacking off since summer, running a few miles off and on but not running on a regular, disciplined basis like I normally do. I haven’t been paying as close attention to what I put in my mouth, either. The combination of not exercising regularly and not eating as good as I should has left me feeling lethargic, sometimes irritable, and has even affected my ability to sleep well. 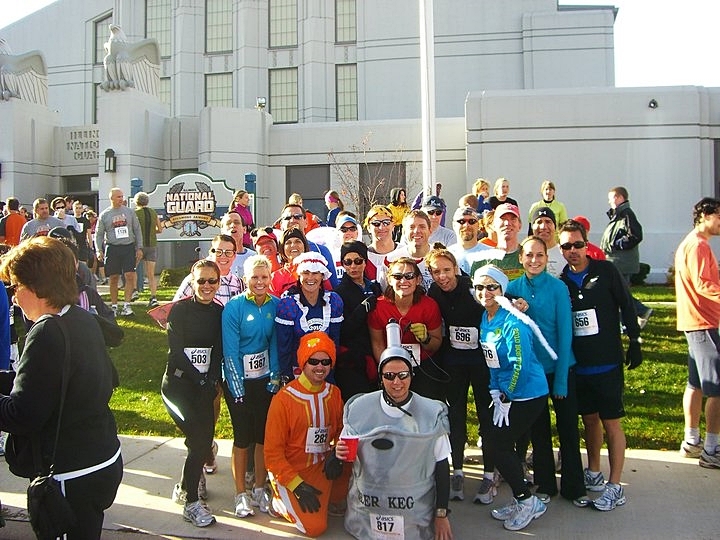 I need to get back into my running routine with these great people that are dressed up for a fun Halloween race in our area. I’m the one with angel wings and white gloves on the right! My bad choices are about to change. Big Time! I just signed up to run a marathon. I’ve already run a few marathons so it’s not new territory for me. My running group is a huge help when training for long distances. 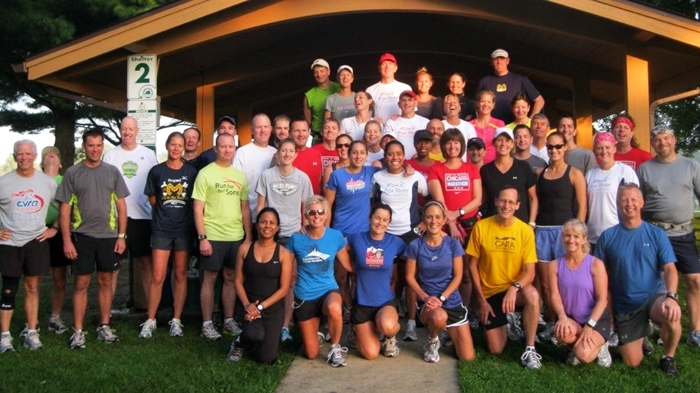 Here we are just prior to a long run (I’m in the purple tank top on the right, front row). We’re smiling now, but we’ll be hot and sweaty when the run is over! Knowing that 26.2 miles lie ahead of you, you realize you can’t be a slacker. The training has to be done … and your food needs to be healthy in order to support the training. The best way I know to motivate myself is to sign up for a competitive event like this. My daughter signed up with me and this will be her first marathon. 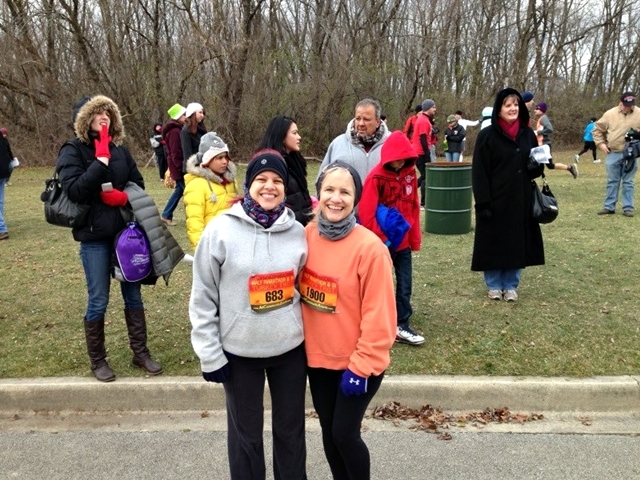 Here we are ready to run a half marathon, 13.1 miles, the Saturday after Thanksgiving. On November 10th, we’ll be running the Naperville Marathon together. That may seem like a long time from now, but it takes discipline, a healthy diet, and a steady routine of regular running for several months. Here, my daughter and I are at the starting line for a local 20-mile race. I do believe a lot of our health problems stem from poor choices we make with food and exercise. So as I grow older, I’m ever more aware of choices that affect my health. I need to lose at least 10 pounds before marathon day … so the journey begins! 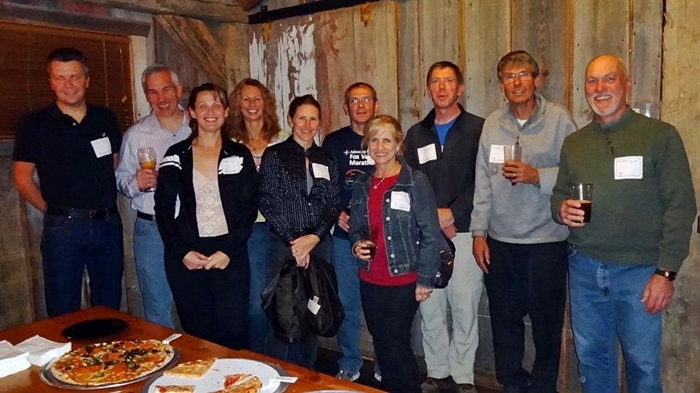 And after the marathon, we’ll celebrate like years past with our running group … we indulged in pizza after all that training! I’m sure I’ll be writing about this from time to time on my blog between now and race day. I’m looking forward to it and glad I made a healthy choice before the situation got out of hand. Do you have any health or fitness goals this year? It’s never too late to start! Good for you! It will be fun to see the transformation to the big day! My kids are marathoners and I know how disciplined they are in their training. My husband and I push each other to work out at night after I get home from work. And we use small plates for our meals to monitor our portions. Good luck in your marathon. Impressive, Jennifer! I know how easy it is to slide down that slippery slope. Being an empty-nester, I have no excuse in the world but somehow I find them. So, for me I am starting to work on getting fruits and veggies in. Oh! and water! Don’t ask me why but those three things seemed to have disappeared from my lifestyle. Keep posting about your progress as it certainly will be inspirational! Hello Jennifer, the things you have mentioned are very much true as that as we grow older we think there is no need to be stay fit and healthy.Without physical stress or activities your body becomes stiff not flexible and fatigue, so a marathon is very good option for you. Definitely preparations give better results, go for it. I’m very impressed. I would never run that distance! Oh, and I LOVE your kitchen! I love your story in between the most amazing photos. I have been thinking the same thing about health. After turning forty it is super important to stay fit and eat good (which I haven’t been) because I feel the effects so much more. I am super tired all the time. I love running too – only 9 miles at most – never 26. This is one post I needed to read today! Thank you!!! Good luck to you !!! That’s wonderful! I can’t imagine having that kind of endurance, but it sounds like you are getting prepared!! I just recently went to Naperville for the first time, and it’s a beautiful area! Great shopping with such a quaint feel. Hi Jennifer – I am sure you will achieve your 10 pound goal before the marathon. It’s nice that your daughter is joining you. I think that alone is such a wonderful motivation. That is great! What a fun you and your daughter will have. Good luck to you and your daughter. I think that is great and a big goal to shoot for, the marathon. Good for you. I know for me if I don’t eat right and do my Pilates on my performer I don’t feel well and get tired an irritable. I try very hard to stay on track. Fantastic, I always love to hear when someone decides that where they are is not where they want to be. Getting healthy,taking care of yourself, getting good rest and exercise is monumental! I have been working on that one for several months and have lost two sizes and feel great. Good for you, Jennifer! I need to lose 10 pounds, too. I put it on after we moved and not working anymore. I never realized using the stairs at work was so good for me as being exercise. I do have plans to exercise at home and get into a more regular walking routine. The thing is I just have to start and get going! Good for you!!! I’m trying to eat better myself this year, because as I get older, I am feeling the results of my poor food choices and it’s time to change all that. Can’t say I could ever run a marathon since I have bad joints and feet, but I’ll be rooting you on. I just realized I haven’t checked out your blog in quite some time. Working out and eating well can be difficult at times. I never feel like I eat well, and most of the time I eat veggies and fruit all day. I guess something is telling me to eat even more and eat them raw. Please, who am I kidding?! I’m very excited for the marathon and also extremely scared and nervous. Oh geeze. I want it to be fun and relaxing. I want it to be a good experience too! Not like my first half marathon! Yikes. I have to make sure I stick to training too, with everything going on it will be hard but at least it’s still far away! We can work on eating good and working out good together! 🙂 Thanks for running with me! I’m excited to hear about your marathon coming up. That seems so daunting to me, but if we all do what we can, we could expect much better health. so glad you linked up to Be Inspired to share it with us! BTW, your foyer area is lovely. A couple of years ago I joined the gym, and thankfully got “addicted” to the benefits. I’m happy to say I can’t stop! It really does make a difference, but I don’t see myself ever running a marathon. Ever since I left my job last October, I have been really lax about exercise. And even though I eat mainly healthy foods, I have simply been eating too much. I don’t dare step on a scale, but I know I’ve put on some pounds because of how my clothes fit. I hate it! I have no desire to run a marathon, but I know I need to lose weight and be healthier. your goal sounds perfect, jennifer! i guess i didn’t realize you lived in or near illinois! i am north of rockford. 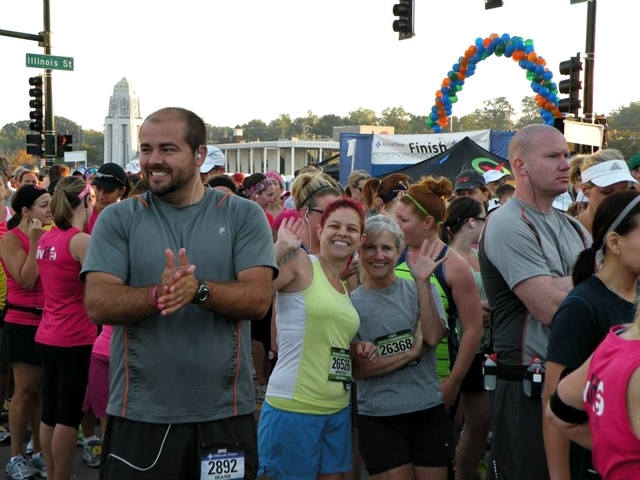 my husband runs marathons, but i have not been conditioned enough to join him. i plan to focus on weight training this year to build strong bones. Good for you Jennifer…I will be cheering you on!!! Oh me too! I was experiencing the same symptoms, only mine is thyroid related. I’m on a new diet now that is composed of 80% alkaline foods and 20% acidic foods to try and balance off my blood ph. It’s hard but after 2 weeks I’m feeling like my old self again. Whew! Good luck with your diet and your marathon, I’m rooting for you! Kudos to you, Jennifer!! Wow! That’s some way to jump back on the bandwagon, girl! lol I’m soooo impressed and proud of you! Unfortunately, I’ve fall OFF the bandwagon with the combination of my mother’s illness (spending every day driving and then sitting at the nursing home), and lots of snow lately. Ugh. Feeling fat, jiggly, and lethargic. I MUST learn to take time to at least get 30 minutes in every morning on my treadmill or the elliptical. My Florida vacation is only 7 weeks away…!!!!!!! So, good luck to you, my friend! You will be my inspiration! Good for you! I began doing weight watchers a couple of months ago and have slowly but steadily been losing weight. I feel like WW is a great lifestyle change for me. I am not great at all about exercising. I know you will do great!